The Bay of Biscay, located along western France and northern Spain, is regarded as one of the world’s most treacherous bodies of water. It has long been notorious among sailors for its fierce storms and rough waters. But in my travels I’ve learned that incredible beauty is sometimes created from a combination of time and the elements, and this is especially true along the northern coast of Spain. March 2018, single shot, additional exposures for highlights, focal length 16 mm, aperture f/11, shutter speed 221 seconds, ISO 31, ND 5-stop filter, tripod. Spain’s rugged northern coast has been pounded for centuries by the sea. And the result is a breathtaking — and often hidden — masterwork of nature known as Prais das Catedrais, or Cathedrals Beach. As if taking a cue from Medieval Europe, nature has carved this rocky coastline into a series of arches and flying buttresses not unlike those that grace Gothic cathedrals. And just like those cathedrals, the jagged formations along Prais das Catedrais inspire a sense of wonder. At high tide, the water from the bay comes in with such force at such a volume that these rocky carvings are completely inundated. It’s possible to stand along this jagged edge of Spain and have no idea of the formations below the surface. But when the water recedes, it reveals contours seemingly carved by a craftsman beneath the water’s surface. When I traveled to northern Spain, I hoped to be able to photograph these formations from the beach, since that’s the angle that allows you to best appreciate arches like the ones at Prais das Catedrais. But it wasn’t possible — the beach was under water for most of my trip. Instead, I climbed to the top of a cliff 20-30 meters above the water for my photographs. Even at that height, the Bay of Biscay was fearsome, and more than once both I and my camera were lashed by waves. Remembering that beauty is often created from time and the elements, I decided to let nature have its way with the beach and I exercised patience in getting my photographs. The result is a photograph that captures the rugged beauty of the Galician coastline, and the majestic arch that I call the Gate of the Winds. 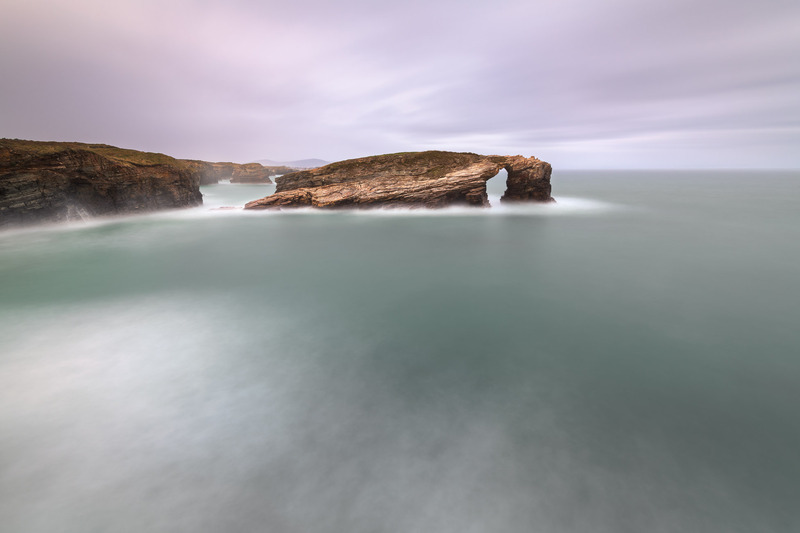 This entry was posted in Landscape and tagged Bay of Biscay, Galicia, Spain.